Some chemists think the internal volume of the cartridge (or column) – without packing material inside is the column volume. While useful in determining scale-up factors, the empty column’s volume is not the CV. The CV of any column or cartridge is the volume inside of a packed cartridge not occupied by the media. This volume includes both the interstitial volume (volume outside of the particles) and the media’s own internal porosity (pore volume). Combined, the two volumes constitute 70% to 80% of the packed cartridge’s volume. Of course this means that the media only occupies 20% to 30% of the space in the cartridge. Figure 1. 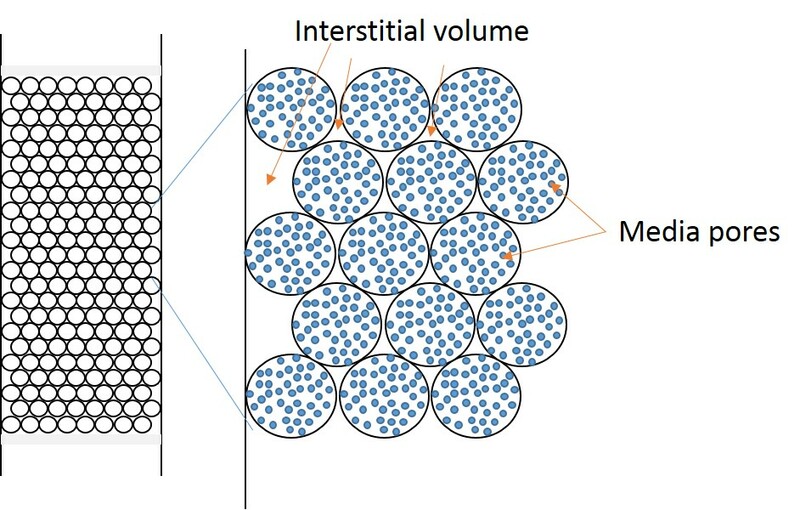 A graphical illustration depicting a packed flash cartridge bed with both media pores (blue) and interstitial volume between particles highlighted. The volume inside the particles and outside the particles create the column volume. You may be wondering why the volume % is expressed as a range. Well, each chromatography packing material has its own pore volume. Because the base media, typically silica, is synthetic, there is always variability from batch to batch, within a batch, and even within a single particle. Media manufacturers always test their product to ensure it conforms to their specifications which is always expressed as a range. One of the primary tests performed on silica is a nitrogen BET analysis that measures both surface area and porosity. Here at Biotage, we test every batch of media we purchase to ensure it meets our specifications. The test results for any media batch are an average surface area and an average pore volume. From the surface area and pore volume the average pore diameter is calculated. Most flash silica used in normal-phase chromatography has an average surface area of 500 m2/g and a calculated pore diameter of 60Å. This equates to a pore volume of 0.75 mL. How did I arrive at this value? I adjusted the equation below, which calculates pore diameter, to calculate pore volume. So, if we multiply the pore volume (0.75 mL/g) by the amount of media in a column or cartridge we will obtain the approximate volume inside the particles in that cartridge. For example, if a flash cartridge contains 10 g of silica and we multiply by 0.75 mL/g we obtain an intra-particle volume of 7.5 mL; this is not the column volume as it does not include the interstitial volume. The interstitial volume factor, at least in slurry-packed HPLC columns, is approximately 0.4. In dry-packed, larger particle flash cartridges I estimate the interstitial factor is about 0.45 because the particles are slightly less densely packed than the typical 3 to 10 micron HPLC column media. Increasing the media’s porosity of course will increase the CV for any cartridge packed with that larger porosity material. Knowing a cartridge’s column volume helps in determining purification run length, gradient profile, and solvent consumption which becomes more critical if a purification method requires scaling up. I hope this all makes some sense. Please let me know if you have other questions relating to flash chromatography. The equation is one I learned many years ago and one for which I do not have a reference. sorry I could not be of more help. Previous Previous post: Flash column equilibration – is it a waste of time or necessary step? Next Next post: Does methanol really dissolve silica during flash column chromatography?